Tired of time-consuming operations with orders? Cheer up, Order Manager Toolkit extension provides you with the convenient tools for quick and efficient order processing. See all the necessary order info with extended order grid, perform order actions in bulk and add order related files to the orders. Have you ever estimated how much time Magento order editing, payments capturing or applying actions take? We checked it out – and were surprised by the results. Save your store manager from these routine and time-consuming tasks by replacing them with automatic actions. Missed delivery dates? Loss of important order information and chaos in order processing? And this is not a complete list of problems caused by inaccurate order management. Magento order management toolkit offers you a dozen of crucial features to avoid common order procedure errors. Editing each order to send invoice makes you frustrated? The solution is at hand - order editor Magento tool. With the extension, you can send invoices, create shipments with tracking numbers and capture payments right from the grid. 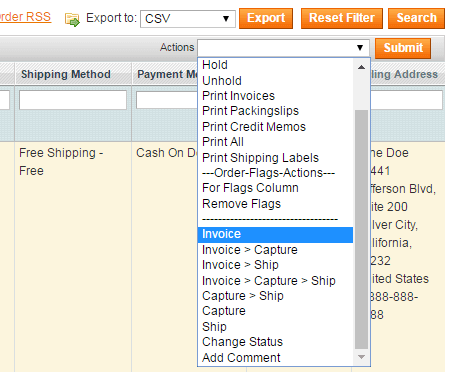 Apply Invoice, Capture > Ship or Invoice > Capture > Ship from the order grid. Just invoice a number of orders or invoice, ship and capture in one go. It’s easy to mark the orders with flags of different colors to easily recognize the priority with the quick glance at the order grid. 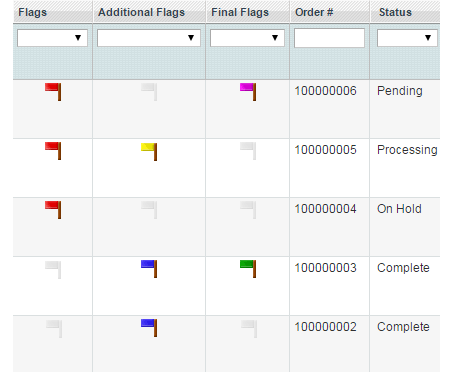 You can also sort orders by flag priority to see the most urgent ones at the top of the list. Search and sort orders by attributes, priority, etc. Now the possibilities for sorting orders by certain characteristics have greatly increased. Search and sort products by any attributes, order priority, attached info, etc. Usually there are a lot of documents and files associated with the order. Now you can attach all of them to the order and then see them on the order view. Nothing will be lost. 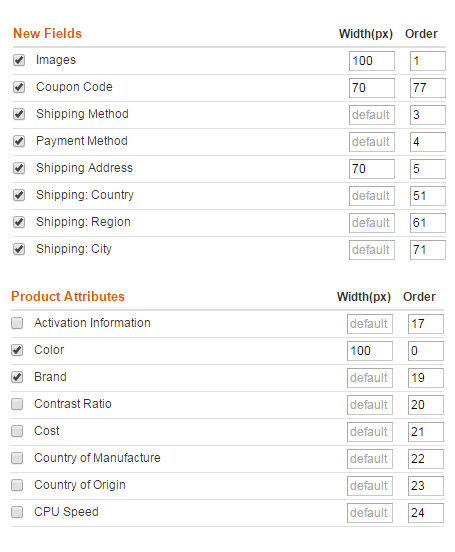 Due to the Magento order editor, you can add any additional columns to the grid, both order related information such as shipping code, payment method, coupon code as well as detailed information about the products included into the order - name, price, sku or any other product attribute. There is no need to open each order view page to find out which products are included into the order. Moreover, thumbnails give you the full picture for visual presentation. Let's say you have additional field ID and select On Hold status for front end and Complete and Pending statuses for back end. The ID field will be displayed on front end only for On Hold orders, while in admin panel it will be displayed for Pending and Complete orders. 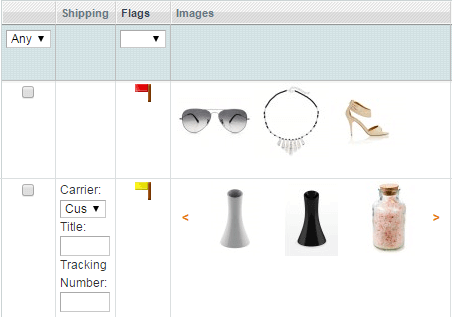 With the Magento order edit module, admin users can add files (images, payment documents or other paperwork) to the order. The files are visible on order page in admin panel. Admins and customers can also upload and see the files. Assign flags to orders for better priority recognition. Add a comment for each order, e.g. a note for managers like Call the client for details on shipping date, Ship today, etc. Create your own flags in addition to default ones. The extension provides the possibility to have multiple columns with flags and apply several flags to one order. Let's say some order is urgent and a certain shipping method was used - you can apply two flags to such order. How it works? You can set a blue flag with ‘high’ priority to be assigned automatically to orders, which get ‘Suspected Fraud’ status as well as to orders with certain shipping or payment method. This extension is absolute must have for any Magento admin, especially for a busy store like us. It will give you full control on your orders and most advanced Report you ever need. My Favorite part is the Configurable Details product, which almost a year i was looking for a solution to have a Configurable product by details in my report. Which everyone even Magento partners mentioned they should change Magento Core, and many customizations should be done to get this details. Keep It Up Amasty. You Guys need a big Hug. A bit 'raw' extension, not all described features run the way I expected. On the other hand, their support is very helpful and after some magic manipulations everything started working great. Very reliable developer that I can recommend to everyone. works great out of the box! I don’t understand why such functionality isn't standardized in Magento because it is a real must have for every shop with wholesale orders. Anyway the extension works great out of the box and a real time saver. Very often our customers call us after they did the order and ask to change something or add some items etc. This is hard to do in magento due to different payment methods and other complex reasons without asking the customer to re-order. Thanks to this extension all the changes are done easily. The only thing I’d like to add if possible – is the possibility to add discounts to the orders, which is a really useful feature. In general, nice work guys - keep it up! Was in two minds whether to buy just mass actions and product grid tools, but greedy part came out on top - and I voted for the pack of tools at a very tempting price. Frankly speaking I don't use order flags at all, but anyway the addon is really juicy and deserves one's attention - high quality, attentive support, clear documentation... nothing to pick at! The app works even better than we expected! Easy to perceive manuals plus attentive support managers and finally we got all settings perfectly fine tuned. Good vendor, great app! Actually, there are tons of similar tools at the market, but I've stopped on this one cause it contains functionality of 3 products in one. The price for such a number of options seemed hot. The app runs well and has no conflicts with other tools we use on our site. Numerous settings appeared to be very easy, so that we managed to setup all necessary options within a few hours. A must-have add-on right from the start! Our store is relatively small for now but the bigger it gets, the harder it was to work with product grid efficiently. Some important information wasn’t shown on the grid, got forgotten and finally lost. This is not how a decent shop works, so we started to look for some solution for a reasonable price. I found Amasty just on Google, read some reviews and decided to try it. We are using the add-on for a couple of weeks now, and it still feels like magic. I totally love the flags, developed a whole system of those! Automatic email templates keep the buyers posted about the status of their order – nice thing to maintain warm relations with customers. Some issues sprung up during the installation of the module. Guys from Amasty support were very helpful and patient. User guide covers everything besides installation, once running extension is easy to use. It’s a pity magento still lacks essential options to let us easily manage ord ers and products. We are operating a relatively small store with about 2k SKUs, but even in our case we do felt the need to optimize our order management. All-in-one extension was exactly what we needed. Although we don’t use every option of the module (due to our specifics), order processing has visibly speed up. After some tweaking and customization we’ve got a really great tool which I highly recommend to all store admins. Allways verry helpful by email also! I do like when one easy tool performs numerous actions, thus one installation solves hundreds of problems at a time. And this module is just about that. The list of features is impressive. The order grid is much more functional now. Especially I like the attachments to orders - lots of times it happened that somrthing was lost. With this extension all data is in one place and in front of my eyes. Nice. – New mass action "Edit order notes and files"